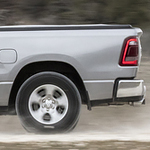 Pickup trucks are a fun vehicle to drive whether you are doing so for work or for play. While it's easy to get lost in the fun of driving these vehicles, safety should remain at the forefront due to the nature of what they are capable of. The 2019 Ram 1500 will keep you safe as you navigate the streets of Kelowna because safety remained at the forefront of its construction. There are so many safety features packed into the Ram 1500 that drivers should feel a real sense of relief once behind the wheel. Features like the 360 Degree Surround View Camera make everyday tasks like parking and loading the vehicle safer by keeping the driver aware of everything around the vehicle. Another feature that you'll learn about after visiting Kelowna Chrysler Dodge Jeep is the available Lane Departure Warning-Plus system. This feature helps to prevent drifting into other lanes by mistake. The system uses a visual alarm to alert drivers then helps to guide them back into proper position.